In the embrace of a pleasant fishing town where the traditional Mediterranean spirit melds with the modern vibe of a coastal town, the bay of Izola is decorated by the Marina hotel. 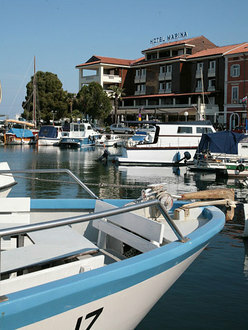 This recently renovated hotel offers 100 beds in 52 air-conditioned rooms, most with a view of the Adriatic sea. The culinary delights taste even better on the renovated terrace of the restaurant, accompanied by a gentle breeze. We have prepared a modern congress hall for business meetings, as well as two massage pools and a sauna for relaxation. The friendly, professional staff is at our guests' disposal 24 hours a day. Welcome. We can't wait to meet you.